According to a report from Nonprofit Vote and the U.S. 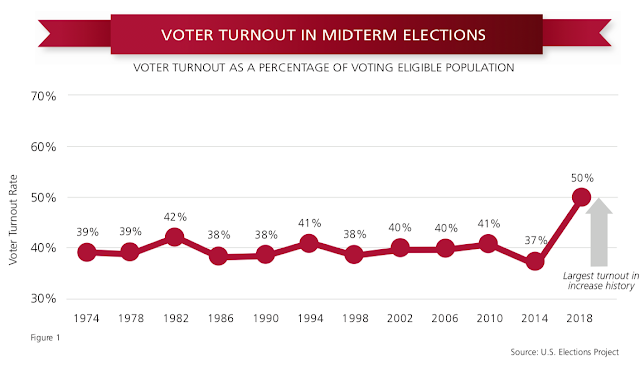 Elections Project, voter turnout in the 2018 midterms was the highest its been in over 100 years. Despite that, vast differences remain between the states due to election policies that make it easier or more difficult to vote. The report referenced above reviews how the 2018 midterm elections were affected by three of those policy differences: (1) same day registration, (2) vote at home (by mail), and (3) automatic voter registration. This chart summarizes their findings. Seven of the 15 states with same day registration (SDR) were among the top ten states in voter turnout. Eight of the ten lowest turnout states have registration deadlines four weeks before the election. Three of the four vote at home (VAH) states ranked in the top seven of 2018 voter turnout. Registration growth was nearly four times higher in the five states reporting automatic voter registration (AVR) data in 2018. Obviously, there are more states that allow SDR and have been doing so for a longer period of time. 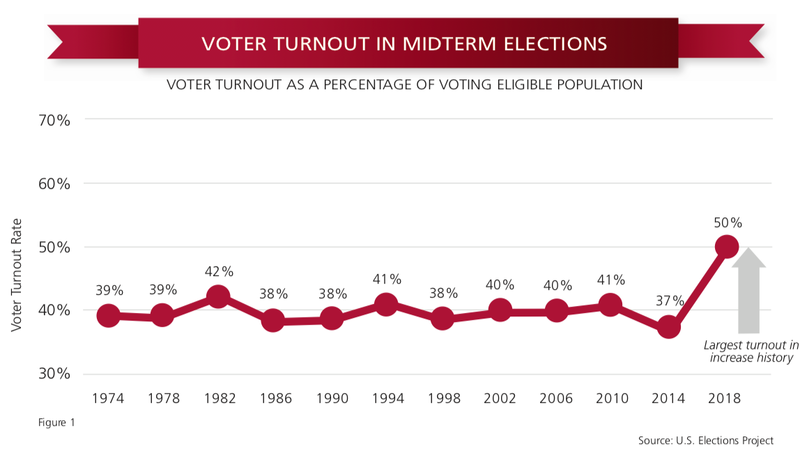 Minnesota, Maine, South Dakota, and Wisconsin have had such policies in place since the 1990s and have consistently had higher voter turnout than the country’s average. Oregon became the first state to implement AVR in 2016. By 2018, 10 more states started doing the same. Thus, research on its impact has been minimal. As the bullet point above suggests, only four states have implemented full vote-at-home programs. An additional seven have a mail ballot option. 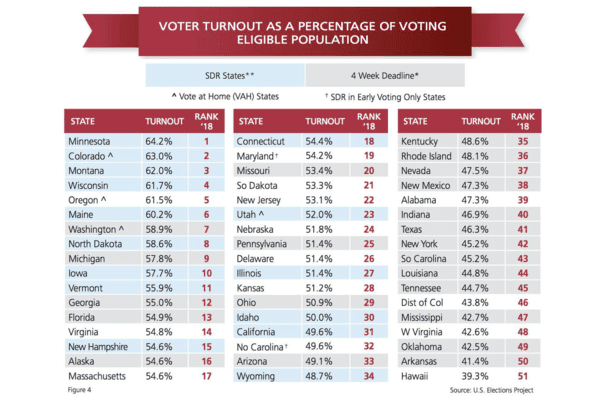 This data demonstrates that state policies with regards to registration and voting location have a significant impact on turnout. That is precisely why the Washington Monthly has been advocating for voting from home for several years now. In response to the voter suppression efforts of Republicans, Democrats at the state level should do more than play defense. We now have sufficient data to prove that going on offense to remove barriers to voting improves turnout. In Utah, vote at home boosted turnout by 5-7 points. Democrats nationwide should pay attention. Progressives need to target the large pool of citizens who are registered but don’t bother to vote.